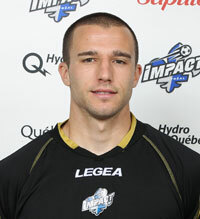 Montreal Impact goalkeeper Evan Bush was named the September Player of the Month in the North American Soccer League (NASL). Bush registered three shutouts in the last three games of the season, maintaining a record of three wins, one loss and one tie in five games in September. He also made 19 saves during that period. The 25-year-old goalkeeper won the 2011 NASL Golden Glove award after leading the league with a 0.76 goals-against average, allowing only 14 goals in 19 games and 1,668 minutes of play. Bush ended the season with a career-best nine shutouts, including seven in his last 10 games of the season. He was named Defensive Player of the Week twice during the season. Bush beat his teammate Ryan Pore by a single point. Minnesota’s Joe Warren, Puerto Rico’s David Foley and Fort Lauderdale’s Brian Shriver also received votes. Votes were cast by media representatives covering NASL teams.